Moving tips: What to do with food and pantry items? Home / Blog / Moving tips: What to do with food and pantry items? Hopefully you are reading this well before moving day, because it is a good idea to start using up all of your food and pantry items well before the move. We usually recommend that you stop buying new pantry items (as well as items like cleaning products and toiletries like shampoo) about 1-2 months before moving and instead focus on using up those that you already have. Otherwise, you are going to waste time and money packing and moving these items. If you still have food items in your refrigerator and pantry before moving day, here is what you should do with them. It is always good moving advice to pack an essentials box. This box should contain all of the items you need for the last few days in your old home and first few days in the new home. Along with essentials like trash bags, utensils, and a few plates and mugs, you should have some instant meals and snacks. Don’t buy any food for the essentials box if you don’t have to! Take these from your pantry! Remember not to pack any perishable foods in the essentials box. You can’t put perishables on the moving truck. A lot of families make the mistake of tossing out all of their food items before moving because they don’t want to bother packing them. In some cases, such as with cheap canned foods and bulky items like bags of pasta, this makes sense. But some food items are pricy and it makes financial sense to move them. Remember, you are going to have to do a big grocery shopping trip after moving into your new home and restocking all those herbs, spices, and specialty items can be expensive. You will need to completely clean out your fridge and freezer at least 3 days before moving. This is because you will need 1-2 days to defrost and clean the freezer. Don’t be wasteful. Instead of tossing fridge and freezer items, give them to your neighbors. Likewise, you will also want to give away any opened food items such as bags of flour, boxes of cookies, and jars of condiments. Trust us, they won’t think it is weird to get your leftover foods – even if they have been opened. You’ve probably got a food bank in your local community. 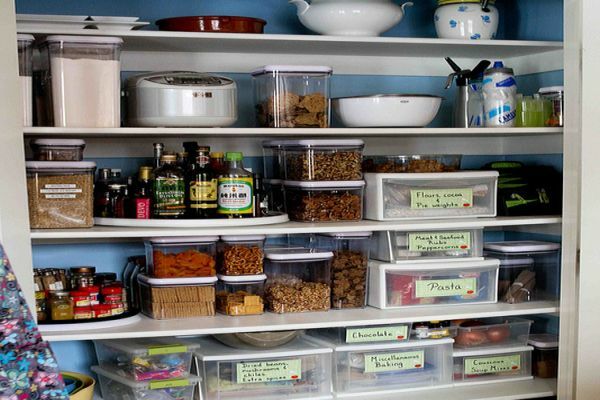 This is a great place to take any unopened food items that you don’t want to move, such as canned goods, bags of pasta, and other non-perishables. Remember to add this task to your moving checklist. Otherwise, you might forget to make the trip to the food bank and end up tossing out food which could have one to a family in need.